I made this sound recording of a frozen lake in the winter of 2005/06 in the area around Berlin. Frozen lakes are known to give off most noise during major fluctuations in temperature: the ice expands or contracts, and the resulting tension in the ice causes cracks to appear. Due to the changes in temperature, the hours of morning and evening are usually the best times to hear these sounds. In my experience, thin ice is especially interesting for acoustic phenomena; it is more elastic and sounds are propagated better across the surface. Snowfall, on the other hand, has a muffling effect and the sound can only travel to a limited extent. 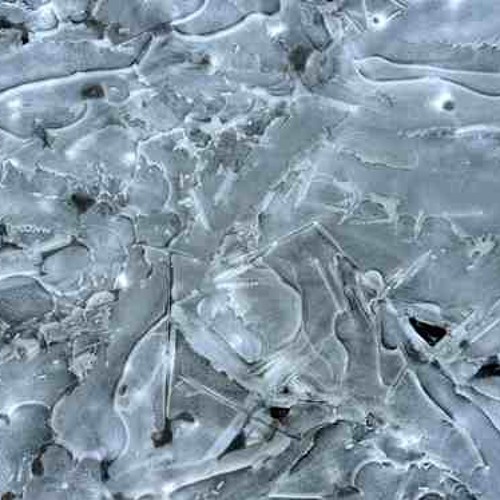 The ice sheet acts as a huge membrane across which the cracking and popping sounds spread. Underwater microphones proved especially well-suited for these recordings: in a small hole drilled close beneath the surface of the water, the sounds emitted by the body of ice carry particularly well. The most striking thing about these recordings is the synthetic-sounding descending tones caused by the phenomenon of the dispersion of sound waves. The high frequencies of the popping and cracking noises are transmitted faster by the ice than the deeper frequencies, which reach the listener with a time lag as glissandi sinking to almost bottomless depths. @andreas-bick: great, I will perform some sort o Impro-DJing Nights the next weeks (feat. Gruenrekorder.de) - also at Madame Claude Feb 1, 2016. May I play it there? Did you step on it, I mean: the ice (and therefore the microphone)? Would love a much longer recording of this. Excellent work! Speed of sound in the air is different then in ice or water. Awesome recording. "Nature" is an awesome musician! I have always loved this sound! You've dropped it 'way low' - cool! Hi Andreas, this is very nice! This is really incredible! Surreal, yet real! Thanks I lived by a lake for a while and have missed the beautiful eerie sound. great sounds,i really love it...sounds organic,the same kind of organic sound that myself seems to explore it from time to time,how do u record thins? ?